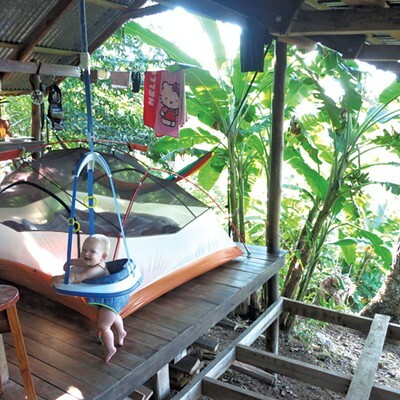 Adventures in Baby Rearing: Parenting Hasn't Slowed Us Down | Features | Kids VT - small people, big ideas! As outdoor photographers and avid adventurers, we've made a living documenting our explorations of remote places such as East Greenland and Chilean Patagonia. So when we discovered that Emily was pregnant with our now-2-year-old daughter, Maiana Snow, our 15 years of explorations together simply seemed like training for the most wonderful and challenging adventure of all — parenthood. Pregnancy didn't stop Emily from staying active. 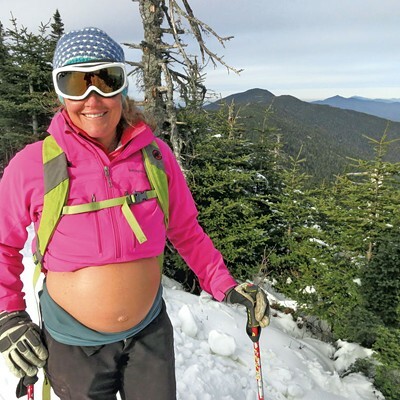 She surfed ocean waves during prenatal travels to Central America and the New England coast until month five, when the pressure on her belly became slightly uncomfortable. 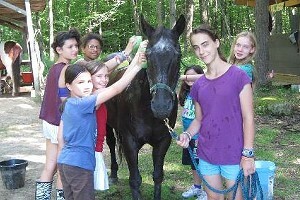 After that, she focused on swimming, paddling or stream walking whenever she felt lured by water. Trail running, biking, walking, stretching and gardening rounded out the mix of outdoor activities that kept her feeling happy, healthy and strong while our Lil' Snowflake — our womb name for Maiana — grew through the summer and fall. When it started snowing, skiing became our focus. In winter, we spend a good part of each day on skis, photographing our mountain adventures, and that year was no exception. 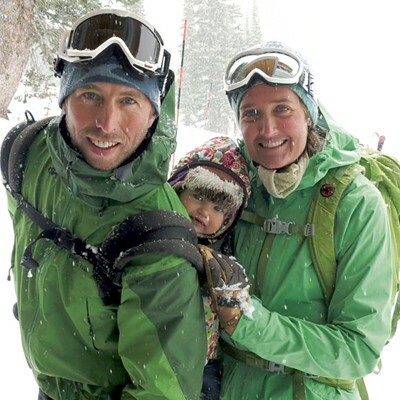 While eating and hydrating well and resting plenty, Emily kept up a near-daily regimen of backcountry skiing adventures — climbing mountains and ridges before skiing down them — straight through her Valentine's Day due date. Five days later, during an easy going sunset ski tour in our neighbor's pasture, Emily felt the first pangs of labor. 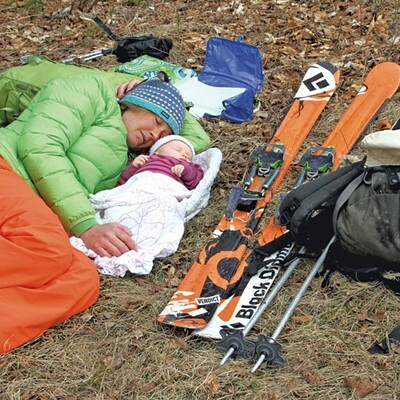 Maiana was just 10 days old when she started skiing with us, nestled in an Ergobaby carrier on Brian's chest. By early March, we had mastered trailside nursing and the backcountry diaper change, and we were back to exploring the remote reaches of Vermont's mountains. Winter's coldest days were behind us, so it was easy to keep Maiana warm and comfortable. 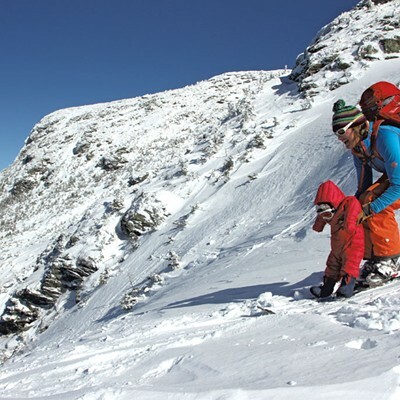 On an idyllic spring day in April, 2-month-old Maiana even joined us on a ski adventure into the highest reaches of New Hampshire's White Mountains. We had few expectations about how Maiana's arrival would impact our adventurous lifestyle, so we were pleasantly surprised by how much we were still able to do as a family of three. Maiana quickly became our all-time favorite adventure partner. She slept just about everywhere we went, she loved the roar of the stream and the hush of the wind, and she rarely fussed. We chalked it up to the abundant fresh air and the fluid motion of skiing. Spring had us camping as a family along the stream behind our house in Moretown. To help Maiana sleep safely, we constructed a simple wooden crate so we wouldn't accidentally kick or press against her while we slept. We placed her changing pad, which doubled as a bed, inside the crate, and Maiana slept peacefully at our feet, with the sound of running water soothing us all. 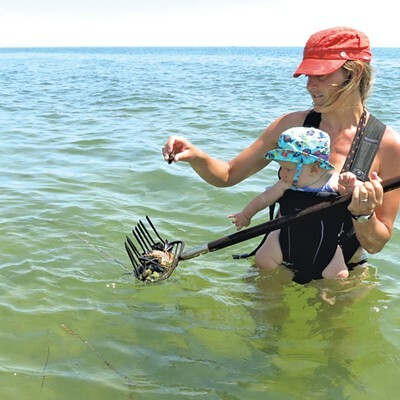 Summer was filled with daily dips in nearby ponds and streams, canoe outings and plenty of hiking and cycling adventures, including a two-week, bicycle-powered surfing trip along the New England coast when Maiana was 7 months old. Our love for outdoor adventure has shaped our livelihoods as photographers and storytellers, and it's shaping our journey as a family. While adventuring, we stick to a few simple rules: Play it safe, keep it fun and be sure to have a good Plan B. Ultimately, staying safe is a matter of being honest about our skills and personal limits, and truly respecting those boundaries. Keeping it fun is as easy as engaging with the natural world around us through song, storytelling, playtime and active observation. And whatever we do, we try to remember the extra diapers. 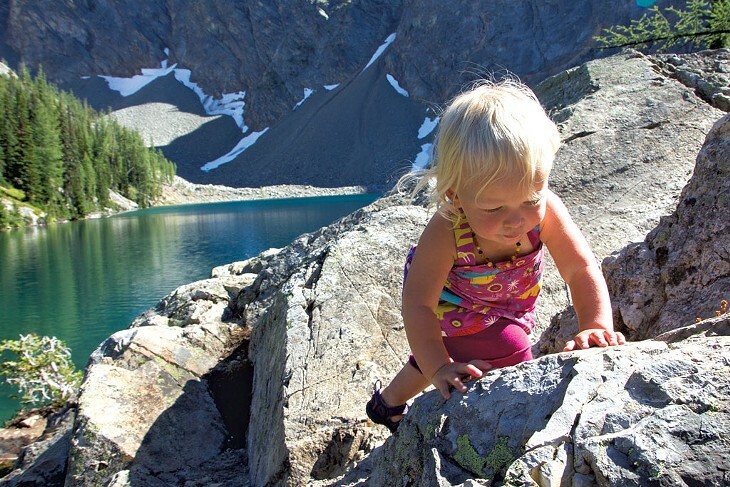 If there is one piece of gear that's invaluable to us, it's the Ergobaby carrier. We used it to carry Maiana on our chests until she was about 10 months old, in combination with the infant insert accessory, and we continue to use it to carry her on our backs. Other items we value greatly include a good sun hat for UV protection and kids' ski goggles — we're often in the woods, pushing through thick forest cover and dodging stray tree branches that could easily scratch an eye. For bringing Maiana on cold and wintry adventures, nothing beats a well-insulated, hooded, one-piece suit, with hands and feet that can be closed off, like Patagonia's Down or Puff Bunting. The Zutano Cozie Shaggie hat, coupled with a wool Buff-brand neck warmer is a nearly foolproof way to keep the wind and cold at bay. It's wise to put a little coconut oil on the face during winter to prevent chapping, too. On the coldest days, we still venture outside, but not for long stretches of time. We check Maiana's hands and feet every 20 to 30 minutes to make sure they're still warm. And if there's a very cold, strong wind blowing, we get away from it.